After designing, making and demonstrating the Nominal thickness Tool Setter last week it has become obvious that the same thing can be achieved with a tweak to the Mach3 Script or the UCCNC macro for tool setting. 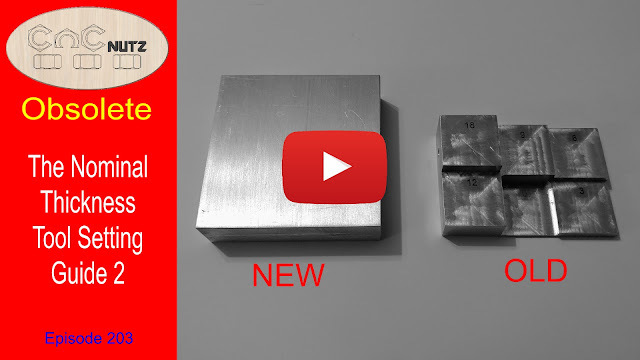 This video shows how this works.There are advantages to a software based solution such as infinate nominal thicknesses and the ability to use whatever tool setter you want. The toolsetter I made still has its place for those who want a hardware based solution of for those who are unable to impliment a software solution because of control software constraints. The date included in the script will allow you to check if you have the most up to date version. There may have been changes to the script for bug fixes or feature inprovement so please check. If you find an issue with a script or Macro please advise me ASAP so that a fix can be found and implimented. Use the contact form on this page. There are 4 scripts available here split into metric and imperial and single plass and 2 pass touchoff. All files are based on Big Tex's Auto zero setting script Select the script you want to use and you will need to change the PlateThickness value to match your tool setter plate but other than the remaining values should be ok. Replace the Aluminium touchoff plate thickness value to match your own plate. Replace the M31.txt in your UCCNC profile with the new one. This script is slightly diffrent from the Mach3 one demonstarted in the video. You need to enter 0 when setting to the surface of the stock as Enter will not work at this time. This will be updated ASAP so keep an eye out for this. Script updated 09/02/18 to remove the need to enter 0 in question box. You can now just press the enter button if you are not using an offset. eg you have the toolsetter on top of the material. Thank you for watching and I hope you fint this useful. Feel free to leave a comment or any suggestions you may have. Thanks for these two different Scripts. I wasn't sure and checked and your scripts for Mach3 were a lot newer than the one I had before and I couldn't even find one for UCCNC at all. Thank you for the scripts,. Again Peter you have out done yourself.Great video can't wait till next week. Thanks Peter. Great work and good videos. Thanks Peter for yet another GREAT video and also for providing the Macro files! Your generosity is more then helpful! Just had a look at the code, nice! One suggestion for a code improvement would be to add a "touch plate to the tool" request at the beginning. This would require the operator to touch the touch plate to the tool to make sure it its working. once it sees the tool touch, it would state "tool touch OK"
Hi Peter its Glen GH from youtube. I updated your script to add the "touch plate to the tool" code.its added at the top of the script as the first item. What is the best way to send it to you? It's me again just to say I know it sounds like I'm stating the obvious. I forgot to mention I use Mach3 if you need a a copy of the various codes I've got I will send them to you.